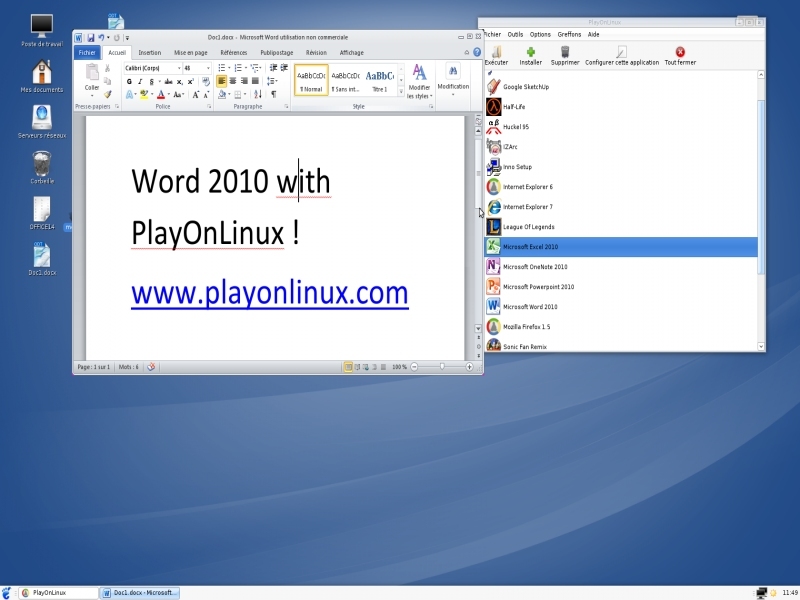 Microsoft Office 2010 - Supported software - PlayOnLinux - Run your Windows applications on Linux easily! #   Updating with the latest stable WineHQ version (3.0.2), ver 1.7.52 does not seem to work. POL_SetupWindow_presentation "$TITLE" "Microsoft" "http://www.microsoft.com" "Quentin PÂRIS" "$PREFIX"
wbinfo -V || POL_Debug_Fatal "Please install winbind (or samba, on Arch Linux) before installing $TITLE"
POL_Shortcut "WINWORD.EXE" "Microsoft Word 2010" "" "" "Office;WordProcessor;"
POL_Shortcut "EXCEL.EXE" "Microsoft Excel 2010" "" "" "Office;Spreadsheet;"
POL_Shortcut "POWERPNT.EXE" "Microsoft Powerpoint 2010" "" "" "Office;Presentation;"
POL_Shortcut "ONENOTE.EXE" "Microsoft OneNote 2010" "" "" "Network;InstantMessaging;" # No category for collaborative work? 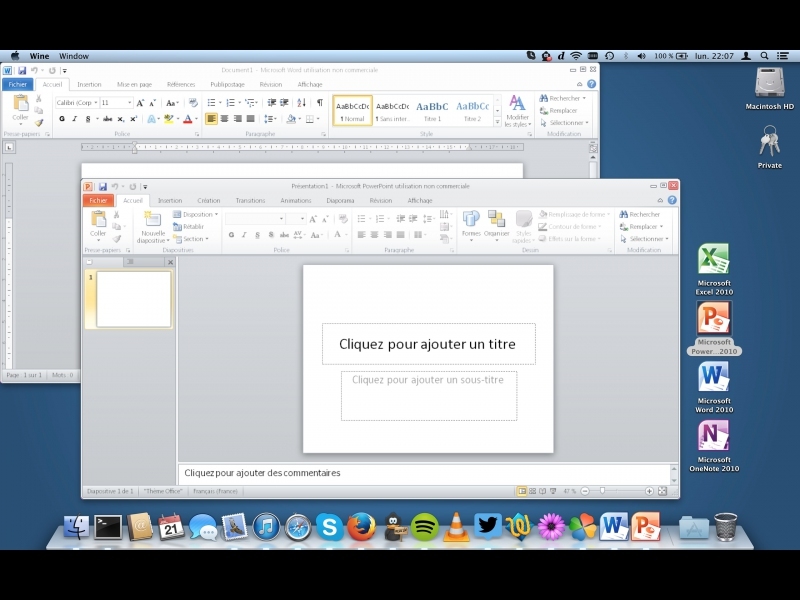 POL_Extension_Write doc "Microsoft Word 2010"
POL_Extension_Write docx "Microsoft Word 2010"
POL_Extension_Write xls "Microsoft Excel 2010"
POL_Extension_Write xlsx "Microsoft Excel 2010"
POL_Extension_Write ppt "Microsoft Powerpoint 2010"
POL_Extension_Write pptx "Microsoft Powerpoint 2010"
POL_Shortcut_InsertBeforeWine "Microsoft Word 2010" "source \"$POL_USER_ROOT/tools/samba3/init\""
POL_Shortcut_InsertBeforeWine "Microsoft Excel 2010" "source \"$POL_USER_ROOT/tools/samba3/init\""
POL_Shortcut_InsertBeforeWine "Microsoft Powerpoint 2010" "source \"$POL_USER_ROOT/tools/samba3/init\""
POL_Shortcut_InsertBeforeWine "Microsoft OneNote 2010" "source \"$POL_USER_ROOT/tools/samba3/init\""
POL_Shortcut_InsertBeforeWine "Microsoft Outlook 2010" "source \"$POL_USER_ROOT/tools/samba3/init\""
Thanks for the link I was looking for it. Office 2010 seems to work really well on my fedora 29 install. I have one problem however. I can't select a Bibliography style (under references, citations & bibliography, style). It says missing. The style-files are present in the correct folder ( ~/.PlayOnLinux/wineprefix/Office2010/drive_c/Program Files/Microsoft Office/Office14/Bibliography/Style). Anyone else that has encountered this problem? Does someone know a solution? I notices someone had the same problem in 2015 but it doesn't have any responses. 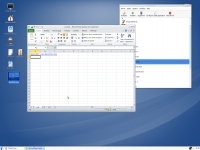 I installed MS Office 2010 (Word, Powerpoint, Excel) on Linux Mint 18.3 Cinnamon 64-bit. The Apps work perfect, only if I try to open any office file with right klick "open with", office does not start and wine crashes with a message it has to refresh something. I think it is because the "open with" funktion uses the comands of the menu entries. 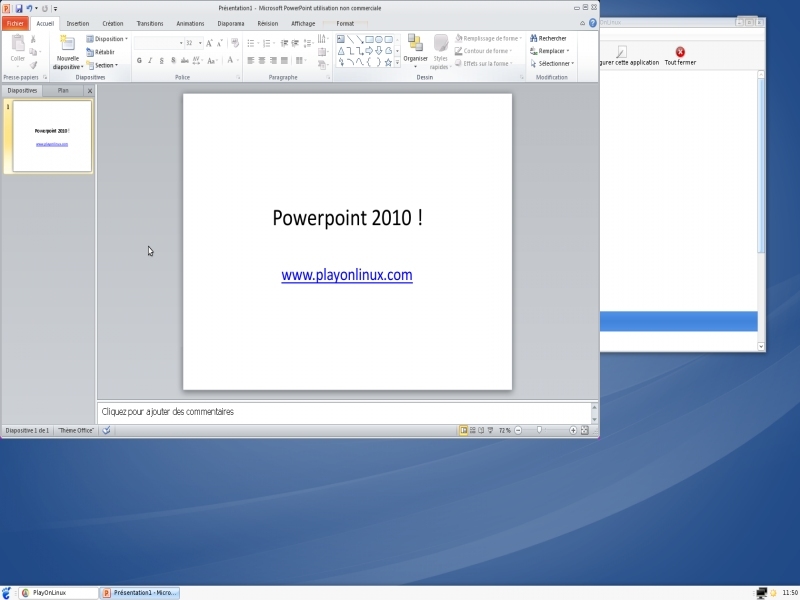 They look like this: "/usr/share/playonlinux/playonlinux --run "Microsoft Powerpoint 2010" %F"
If I use this command without the "%F" at the end as a custom "open with" command. Everything works fine. Maybe you could fix that and tell me what is the problem with "%F"?! POL seems to work straight. Anyway, I have a problem with installing MS Office 2010 Pro (32-bit). First of all: My OS is Linux Mint 19.1 + Cinnamon, PlayOnLinux v4.2.12-1, Wine-stable v3.0-1ubuntu1 and Wine64 v3.0-1ubuntu1 packages are installed, as well as Wine v3.0.2 via POL. Wine-mono and Wine-gecko packages have been installed casually while I was trying to install Office the first time. By now, I don't have any ideas left. Maybe someone else does, I would be enthusiastic. ???-?? ?? ???????? ???? ????????? ? ??? ?, ????????? ????? ????? ???????????.
? Wine 3.21 (x86) ? ??????????? winetricks riched30 msxml3 msxml6 corefonts tahoma vb6run vcrun6 ???????? ??????? ?, ??? ??????? ??????? ?????? Hey this script is awesome, but I hope you don't mind I added "samba" to the prompt for checking winbind - the package lib32-libwbclient that substitutes for winbind on Arch has been deprecated. Installing samba makes this script work perfectly. -        wbinfo -V || POL_Debug_Fatal "Please install winbind before installing $TITLE"
+        wbinfo -V || POL_Debug_Fatal "Please install winbind (or samba, on Arch Linux) before installing $TITLE"
I installed the new installer via the script in August 2018 on Kubuntu 18.04. The paket "msttcorefonts" was already installed on the computer. Everything worked/works fine, except I had problems displaying and printing diacriticial characters (e.g. "special" letters in Indian names, etc.) in Word documents that used Times New Roman. They were displayed and printed as little boxes. A quick search on the internet showed me that probably the font Times New Roman was missing. Most other common Windows fonts were in there already (Arial, Calibri etc.). Why is Times New Roman missing? (Perhaps this has been fixed in the meantime). I tried with "mspatcha " and solved my errors with the "setup.exe "
Would be very nice if someone could help me if it is a playonlinux thing and how I could fix it. Thenk you very much in advance! Error message that appeared during normal installation (default). Manual installation of MSXML 6 was performed, but without success. I noticed the installers are not including dotnet20 or gdiplus ? I am new to wine and playonlinux so maybe im missing something. I am currently under the assuption that the new script is working becuase the user had tried the original one that has theses required componets ? Your most recent script was not working for me. I deleted my bottle and modified the installer on this thread after looking through it. To add the componets I assumed to be missing. I am new and this is my first attempt to contribute. please be gentle I have used the I want to submit an improvement feature. +#   Updating with the latest stable WineHQ version (3.0.2), ver 1.7.52 does not seem to work. I am running Ubuntu16.04 and trying to install Microsoft Office Home & Student 2010. "Error in main Please install winbind before installing Microsoft Office 2010"
however, according to Synaptic Package Manager, winbind is already installed. So, I would like to use the installer on this site. However, I cannot make the script run and do not know how to proceed. I am not a programer, and am relatively new to Linux. I solved this by following details in an article on GitHub called "Install Microsoft Office 2010 on Ubuntu"
Specifically, although Synaptic Package Manager told me that winbind is already installed, I reinstalled it, along with samba. Also installed Wine 2.13. Don't know which of these helped, but it is now running. BTW, advantages of 2010 over 2007 include that imported documents no longer mysteriously lose spaces as they did in Word 2007 (bad news for a proofreader), no problems printing (as there were initially, but not finally with Office 2007), and I can now access my USB drives through Office 2010, which I couldn't on 2007 via Wine. From the GitHub article: In the POL window menu, go to Tools > Manage Wine versions and install Wine 2.13. Versions below it will crash after click on a document hyperlink. Versions above it will not properly handle the launcher icon (due missing WM_CLASS when window is maximized). In Ubuntu 18, the current script gets stuck in Office setup screen. I have fixed it by setting wine version to system version (3.0) then running setup.exe. But of course, in the end, it does not create links. I am not sure how to improve the script but just reporting this so you can fix it :) So it is just the wine version. This modification was made to stop OneNote from crashing immediately after pasting something out of the application. 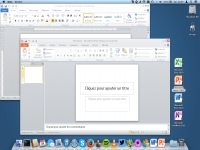 No other Office 2010 applications have been tested with this script. I like the idea of this program, but it will not install office 2010, I keep getting an error from wine about installation language not supported how do I fix this? First of all, the program winbind is needed. Second, there is a problem with the freetype fonts and libz. By removing the libz library files shipped by playonlinux the installer runs. When you want to use an *.iso file to install from, first mount it, and point the installer to the setup.exe file. I uninstalled both MSO and Playonlinux to reinstall. I can reinstall Playonlinux, no pb, but when I want to install MSO 2010 tu usual way, I can't. Any idea about how I could fix it? declare -x OLDPWD="/home/vlemquov/.PlayOnLinux/configurations/setups/Microsoft Office 2010"
declare -x SCRIPTID="Microsoft Office 2010"
declare -x TITLE="Microsoft Office 2010"
It look likes you have the same issue with freetype fonts as i had. Does the solution I proposed on this page https://www.playonlinux.com/en/app-801.html works? I don't think this has been posted as an issue recently enough for the problem or solutions to be the same as what I have read before. I have installed Word 2010, but it will not activate. I get an error message "A Communication Error has Occured. Please verify that you have connectivity to the internet and try again. (0x80072F0D). Wine 2.0.2.
wine: configuration in '/home/wallythander/.PlayOnLinux//wineprefix/Office2010' has been updated. Most of the suite works very well. When using OneNote, however, you find that you cannot copy-paste without crashing OneNote. Solution: use wine 2.x. When I use the wineprefix that was installed by PoL with a 2.x version of wine, the copy-paste bug has been fixed. I've installed office2010, but the icons of this program aren't the tipical of Microsoft instead are icons of playonlinux, and I don't know how to change them. Could someone help me with it, please? I just installed POL 4.2.10 on RHEL 6.9 and installed Office 2010 with no problems, work fine! I just have a problem, the bottle can't access to Internet, when I try to connect with Outlook or save a document with Word / Excel to our sharepoint the application can't connect. I want to congratulate you for this extension in PlayOnLinux platform. I want to ask something that involves also my job. Can you make it possible to get Access on this installation cause my work is focused on databases and I'm facing a lot of troubles with LibreOffice and OpenOffice databases. I'm sure that you have make some test and a lot of code line but I really want it. Thank you and keep making linux users happy. 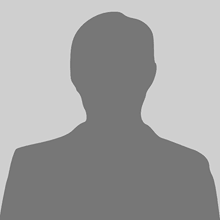 -PDF export with formulas ! PS: I used wine 1.7.52 pre-config inside Playonlinux 4.2.10 for Office 2010, then switched to wine 2.1 after install (cf. WineHQ). Hello there, im using linux mint 18.1. Im newbie in linux distro and i try to install this and get that error. What should i do to install it ? I have the same problem as you have, I'm also a newbie with Ubuntu 16.04 and when I want to install it, I'll get the same error as you get. This version 1.7 seems exist a bug that could lead to no math formula in PDF when export . maybe the script should update the wine version? "can not open the file "Normal.dotm, because of wrong content!" And then there are a list of error message occur! I am able to launch all Office programs but I have a problem with Outlook. I am trying to add Exchange account but Outlook gives me an error. I've googled a lot and didn't find a solution. I am using Ubuntu 16.04 x64. Hi, I've installed Office 2010 with playonlinux and it works great except a few things. I'm using OneNote in which you can normally attach a file to a note or "print it" directly in it. When I try to attach a file, nothing happens, and I don't know why. When I try to print a PDF file in the note, it says that I have to install a program that can read PDF, but how can I do that in the same virtual drive as Office ? And when I try to print a DOC, DOCX or ODT file, it asks me to install Microsoft XPS Essentials, and I can only download a .msu file I can't find a way to install. Thanks for your hep ! 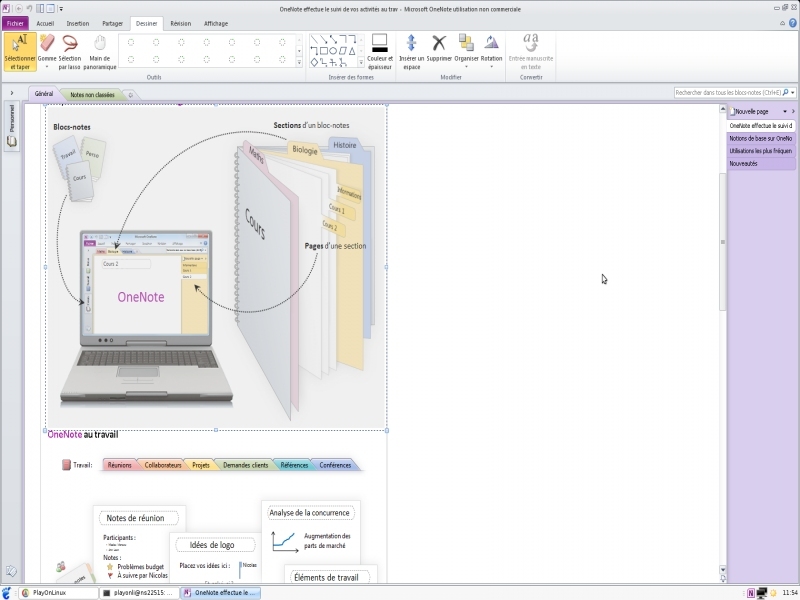 Visio 2010 Premium works awesome too. Add it to installer. Thanks for making this excellent installer. I'm impressed! - the option/alt key does not work in Excel 2010. Im a huge Excel user, and miss the alt key alot. When I make a quickfilter with CTRL+SHFT+L, I use the ALT/OPTION key to select items. Do you perhaps know how to fix this? ps. alt + down, allows you to enter the menu in the quick filter. It is a very powerful shortcut, when managing data. I installed Office 2010 in oct/nov and it worked flawlessly on POL 4.2.09 ubuntu 15.04. I messed up the virtual drive so needed to reinstall. Now getting error message "a newer version of windows is needed". I tried to install using older script from 13 oct 2015, same error message. Updated to POL4.2.10 same result. I have succesfully installed Office with your script. However, I notice an issue with dual screen. I use a laptop and an external screen with different resolution. When I maximize the window in the external screen, the window don't use the full screen (I have an empty band on the top). In the same way, I can't use the slideshow with both screens and I can't configure the slideshow. I don't know if there is some tips for solving this, in particular for powerpoint slide shows. 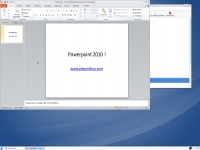 -POL_Shortcut "POWERPNT.EXE" "Microsoft Powerpoint 2010" "" "" "Office;Presentation;"
+POL_Shortcut "POWERPNT.EXE" "Microsoft PowerPoint 2010" "" "" "Office;Presentation;"
-POL_Extension_Write ppt "Microsoft Powerpoint 2010"
-POL_Extension_Write pptx "Microsoft Powerpoint 2010"
+POL_Extension_Write ppt "Microsoft PowerPoint 2010"
+POL_Extension_Write pptx "Microsoft PowerPoint 2010"
-    POL_Shortcut_InsertBeforeWine "Microsoft Powerpoint 2010" "source \"$POL_USER_ROOT/tools/samba3/init\""
+    POL_Shortcut_InsertBeforeWine "Microsoft PowerPoint 2010" "source \"$POL_USER_ROOT/tools/samba3/init\""
+POL_SetupWindow_message "$(eval_gettext '$TITLE has been installed successfully\n\nIf any installation windows prevent your programs from running, you must remove and reinstall $TITLE.')" "$TITLE"
POL_SetupWindow_message "$(eval_gettext '$TITLE has been installed successfully\n\nIf any installation windows prevent your programs from running, you must remove and reinstall $TITLE.')" "$TITLE"
The Word 2010 bibliography tool doesn't work. I have a document with several citations created in Windows. Using Word 2010 with POL shows there are no sources available. They should show up on the document side in the bibliography tool. Copying the master source list "sources.xml" into the correspondent directory in the POL virtual drive (in my case it's Office2010/drive_c/users/ps/Application Data/Microsoft/Bibliography) doesn't change anything - the sources are not shown in the tool's master list side. I tested by creating a new source: When saving, I get an error message saying that the source list is write protected, the word crashes. What can I do to help improving this bug? +POL_Shortcut "MSPUB.EXE" "Microsoft Publisher 2010" "" "" ""
+POL_Extension_Write pub "Microsoft Publisher 2010"
+    POL_Shortcut_InsertBeforeWine "Microsoft Publisher 2010" "source \"$POL_USER_ROOT/tools/samba3/init\""
POL_Shortcut "MSPUB.EXE" "Microsoft Publisher 2010" "" "" ""
POL_Extension_Write pub "Microsoft Publisher 2010"
POL_Shortcut_InsertBeforeWine "Microsoft Publisher 2010" "source \"$POL_USER_ROOT/tools/samba3/init\""
Discalimer: I am new to linux. I apologize if I am not posting in the correct forum. Linux Mint 17.1 Xfce 64bit. Installation of Microsoft Office 2010 works seamlessly with PlayonLinux. 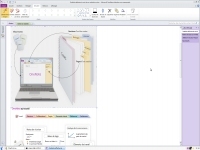 However, the built in eqaution editor in Word 2010 does not function and causes the program to crash. This is a critical problem based on my needs. I have unistalled and reinstalled multiple times with no change. Also, I have made sure to have updated versions of winbind, wine-mono, etc on my machine. Unhandled exception: page fault on read access to 0x0000004c in 32-bit code (0x7e7bf120). It is not going install service pack, and also is problem with bibliothek. Office 2010 is only for face good, but really is danger under wine (play onlinux). We must wait for better support of office 2010 (now is year 2015). -POL_Shortcut "WINWORD.EXE" "Microsoft Word 2010"
-POL_Shortcut "EXCEL.EXE" "Microsoft Excel 2010"
-POL_Shortcut "POWERPNT.EXE" "Microsoft Powerpoint 2010"
-POL_Shortcut "ONENOTE.EXE" "Microsoft OneNote 2010"
-POL_Shortcut "OUTLOOK.EXE" "Microsoft Outlook 2010"
+POL_Shortcut "WINWORD.EXE" "Microsoft Word 2010" "" "" "Office;WordProcessor;"
+POL_Shortcut "EXCEL.EXE" "Microsoft Excel 2010" "" "" "Office;Spreadsheet;"
+POL_Shortcut "ONENOTE.EXE" "Microsoft OneNote 2010" "" "" "Network;InstantMessaging;" # No category for collaborative work? My installation of Office 2010 (with the newest PoL version from PPA) creates lots of .lnk-files in the same directory as the source files. With this folder, the .lnk-files are created there. Maybe, it would also be good to periodically remove these superfluous files in the Recent-folder. I'm sorry for not being able to produce the code myself. Cheers! That bug report says that this bug was fixed in 1.7.14. This sounds like a Wine problem. I used the script on Wine 1.7.52, but still had to create that folder manually. J'ai tout de même un petit soucis avec le "point" du pavé numérique. Mais franchement c'est du super boulot! At the end of the installer, it says "If an installation Windows prevent your programs from running, you must remove and reinstall'. I don't think it's supposed to say that. I think it's supposed to say that you will need to remove and reinstall if it gives you messages saying you don't have WIndows, as Microsoft has been taking measures to prevent Microsoft software from working with Wine. POL_Shortcut "WINWORD.EXE" "Microsoft Word 2010"
POL_Shortcut "EXCEL.EXE" "Microsoft Excel 2010"
+POL_Shortcut "POWERPNT.EXE" "Microsoft PowerPoint 2010"
POL_Shortcut "ONENOTE.EXE" "Microsoft OneNote 2010"
POL_Shortcut "OUTLOOK.EXE" "Microsoft Outlook 2010"
POL_Shortcut "POWERPNT.EXE" "Microsoft PowerPoint 2010"
+    POL_Shortcut_InsertBeforeWine "Microsoft Word 2010" "source \"$POL_USER_ROOT/tools/samba3/init\""
+    POL_Shortcut_InsertBeforeWine "Microsoft Excel 2010" "source \"$POL_USER_ROOT/tools/samba3/init\""
+    POL_Shortcut_InsertBeforeWine "Microsoft OneNote 2010" "source \"$POL_USER_ROOT/tools/samba3/init\""
+    POL_Shortcut_InsertBeforeWine "Microsoft Outlook 2010" "source \"$POL_USER_ROOT/tools/samba3/init\""